The job description for this post varies depending on the firm, the firms can be law firm, accounting firm, CPA firm, partnership firm and so on; some of the common job tasks that are typically carried out in an office firm is mentioned on the Firm Administrator Resume and such are – executing both secretarial and administrative tasks, performing bookkeeping and inventory tasks, coordinating office calendar, collecting and maintaining office equipment and supplies, creating and modifying documents such as reports, memos or letters; attending phone calls and scheduling meetings, taking meeting minutes, supervising junior staff, making travel arrangements and ensuring that specific projects are completed on time and within the budget. Employers want to see in their potential Firm Administrators skills such as – organizational and planning skills, telephone etiquette, multitasking, and workload prioritization skills, project management expertise and strong technological proficiency. A Business – related or law-related education is commonplace among Firm Administrators. 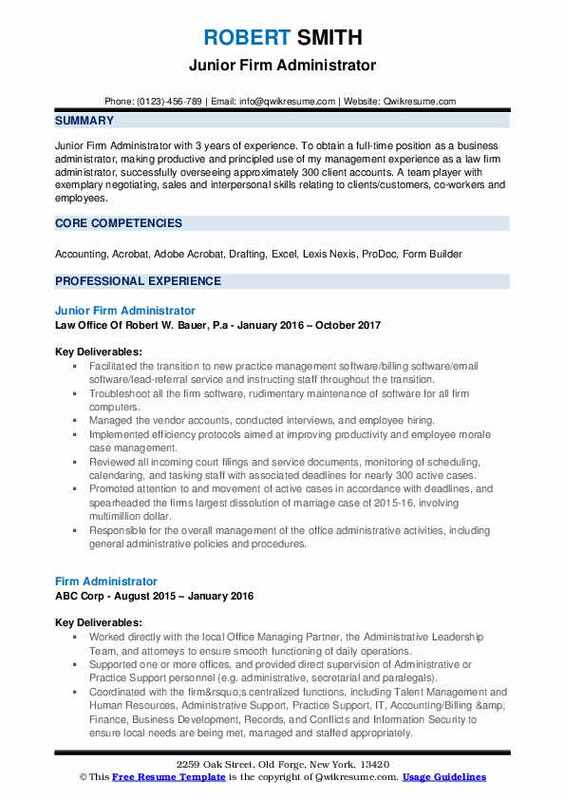 Summary : Seasoned, ambitious Firm Administrator III with 21 years of experience in managing professional service organizations. Skilled in the design and implementation of sound, efficient administrative and financial policies and procedures that align with corporate goals and ensure compliance with strict industry standards. Adaptable management style suitable to dynamic environments with emphasis on thoroughness and accuracy. Responsible for the daily operations of a small public accounting firm. Oversaw the maintenance and classification of client databases and records. Sole administration of monthly billing and accounts receivable and generated reports. Supervised equipment maintenance, research procurement, office staff training and contract management. Maintained the internal network, including daily data back-ups, installation of all software, coordinated with outsourced IT company for complex issues. Assembled the individual and business income tax returns, including electronic filing administration. Ordered office supplies, equipment, office furniture and firm stationery as needed. Coordinated the maintenance requests with facilities management and repairs of office equipment. Coordinated tax season kick-off meeting and weekly staff meetings, including agendas. Answered and screened a heavy volume of telephone calls, coordinating schedules and appointments. 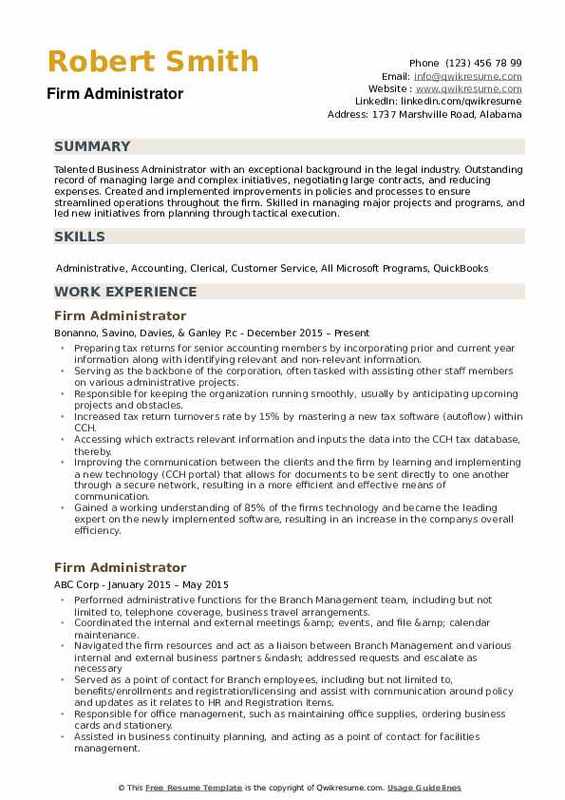 Objective : Junior Firm Administrator with 3 years of experience. 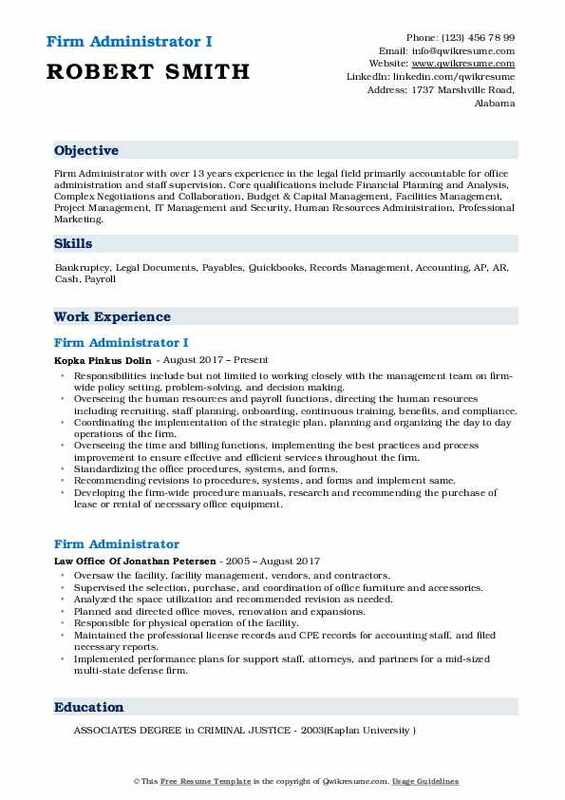 To obtain a full-time position as a business administrator, making productive and principled use of my management experience as a law firm administrator, successfully overseeing approximately 300 client accounts. A team player with exemplary negotiating, sales and interpersonal skills relating to clients/customers, co-workers and employees. Facilitated the transition to new practice management software/billing software/email software/lead-referral service and instructing staff throughout the transition. Troubleshoot all the firm software, rudimentary maintenance of software for all firm computers. Managed the vendor accounts, conducted interviews, and employee hiring. Implemented efficiency protocols aimed at improving productivity and employee morale case management. Reviewed all incoming court filings and service documents, monitoring of scheduling, calendaring, and tasking staff with associated deadlines for nearly 300 active cases. Promoted attention to and movement of active cases in accordance with deadlines, and spearheaded the firms largest dissolution of marriage case of 2015-16, involving multimillion dollar. 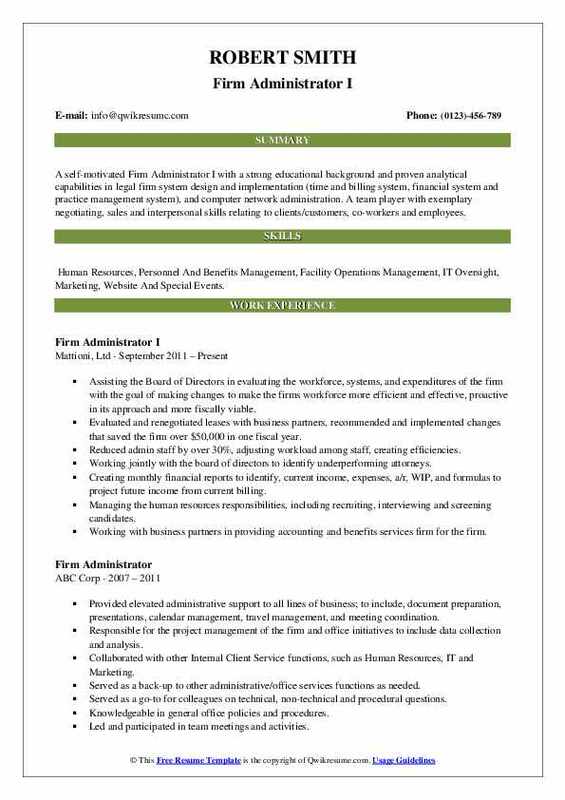 Responsible for the overall management of the office administrative activities, including general administrative policies and procedures. Executed decisions of the Firm, works with partners and business line leaders and served as the liaison between partners, staff, the local office and other offices within the Firm. Summary : A self-motivated Firm Administrator I with a strong educational background and proven analytical capabilities in legal firm system design and implementation (time and billing system, financial system and practice management system), and computer network administration. A team player with exemplary negotiating, sales and interpersonal skills relating to clients/customers, co-workers and employees. Skills : Human Resources, Personnel And Benefits Management, Facility Operations Management, IT Oversight, Marketing, Website And Special Events. Assisting the Board of Directors in evaluating the workforce, systems, and expenditures of the firm with the goal of making changes to make the firm's workforce more efficient and effective, proactive in its approach and more fiscally viable. Evaluated and renegotiated leases with business partners, recommended and implemented changes that saved the firm over $50,000 in one fiscal year. Reduced admin staff by over 30%, adjusting workload among staff, creating efficiencies. Working jointly with the board of directors to identify underperforming attorneys. Creating monthly financial reports to identify, current income, expenses, a/r, WIP, and formulas to project future income from current billing. 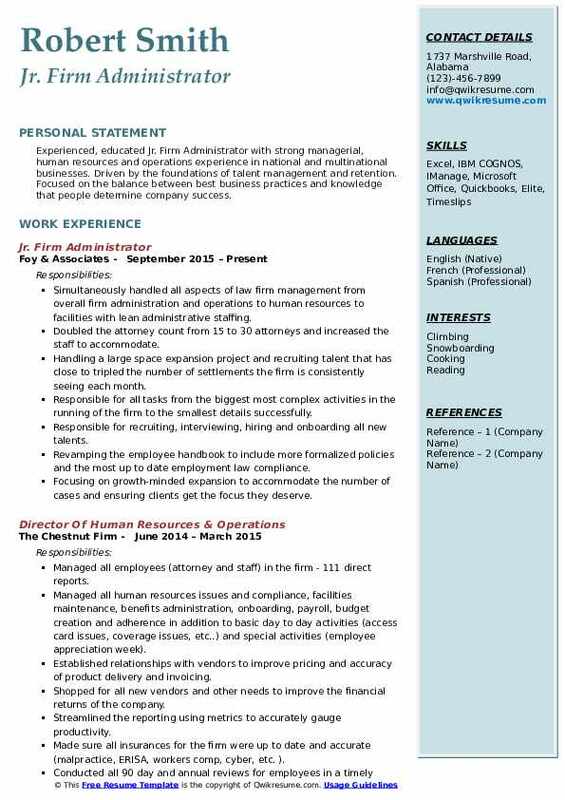 Managing the human resources responsibilities, including recruiting, interviewing and screening candidates. Working with business partners in providing accounting and benefits services firm for the firm. Creating an RFP for the new computer system, either on-site or externally hosted. Summary : Dynamic leadership career as Firm Administrator III with a successful track record of 22 years of creating collaborative business environments. Using astute strategic, business, and financial skills to manage diverse organizations. Respected for demonstrating good judgment and integrity while managing multiple departments. Extensive success in implementing and automating systems that significantly improve accounting, estimating, and project management functions. Managing a small law firm and overseeing all financial responsibilities to include Accounts receivable and accounts payable, online bank transfers between operating and trust accounts. Daily processing of bank deposits, biweekly payroll for a staff of 10, e-payments of 940/941 federal taxes. Responsible for the day-to-day administrative support of partners and staff. Answering phones, taking messages, handling all mail. Scanning all incoming documents to officetools software for staff use. Set up new clients tasks in officetools. Processing the completed tax returns and contacting the clients that their return was now ready. Meeting with clients to finalize their returns. Entering the weekly charges for payroll clients into officetools. Preparing deposits for the bank and recording payments into QuickBooks. Working on special projects for accountants partners. Organized incoming client documents in to a more “user friendly” format. Objective : Experienced, educated Jr. Firm Administrator with strong managerial, human resources and operations experience in national and multinational businesses. Driven by the foundations of talent management and retention. Focused on the balance between best business practices and knowledge that people determine company success. Simultaneously handled all aspects of law firm management from overall firm administration and operations to human resources to facilities with lean administrative staffing. Doubled the attorney count from 15 to 30 attorneys and increased the staff to accommodate. Handling a large space expansion project and recruiting talent that has close to tripled the number of settlements the firm is consistently seeing each month. Responsible for all tasks from the biggest most complex activities in the running of the firm to the smallest details successfully. Responsible for recruiting, interviewing, hiring and onboarding all new talents. Revamping the employee handbook to include more formalized policies and the most up to date employment law compliance. Focusing on growth-minded expansion to accommodate the number of cases and ensuring clients get the focus they deserve. 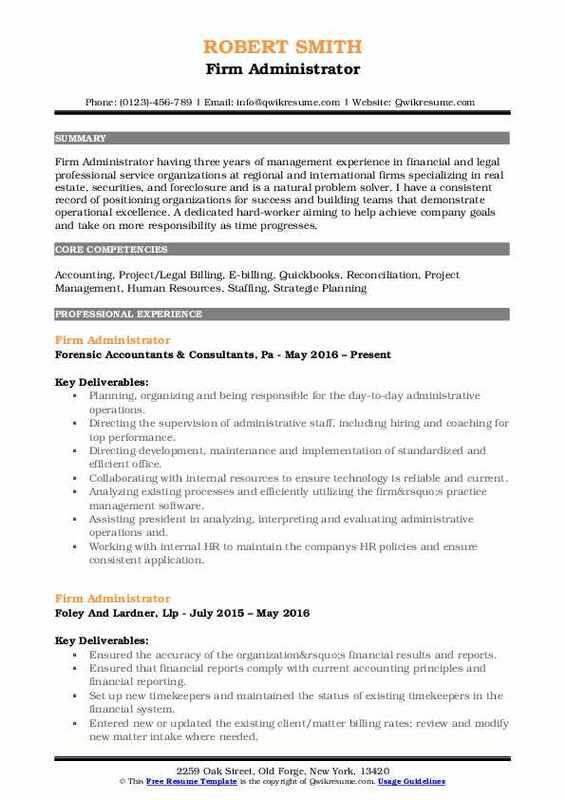 Summary : Firm Administrator with over 13 years experience in the legal field primarily accountable for office administration and staff supervision. Core qualifications include Financial Planning and Analysis, Complex Negotiations and Collaboration, Budget & Capital Management, Facilities Management, Project Management, IT Management and Security, Human Resources Administration, Professional Marketing. Responsibilities include but not limited to working closely with the management team on firm-wide policy setting, problem-solving, and decision making. Overseeing the human resources and payroll functions, directing the human resources including recruiting, staff planning, onboarding, continuous training, benefits, and compliance. Coordinating the implementation of the strategic plan, planning and organizing the day to day operations of the firm. Overseeing the time and billing functions, implementing the best practices and process improvement to ensure effective and efficient services throughout the firm. Standardizing the office procedures, systems, and forms. Recommending revisions to procedures, systems, and forms and implement same. Developing the firm-wide procedure manuals, research and recommending the purchase of lease or rental of necessary office equipment. Developing and managing the firm-wide meetings and events. Objective : Highly skilled Firm Administrator with a solid background in business operations, accounting and customer service. Streamlines procedures and increases efficiency through effective business strategies. Technically proficient in Excel, PowerPoint, Word, Outlook, Abode Acrobat, social media and graphic design. 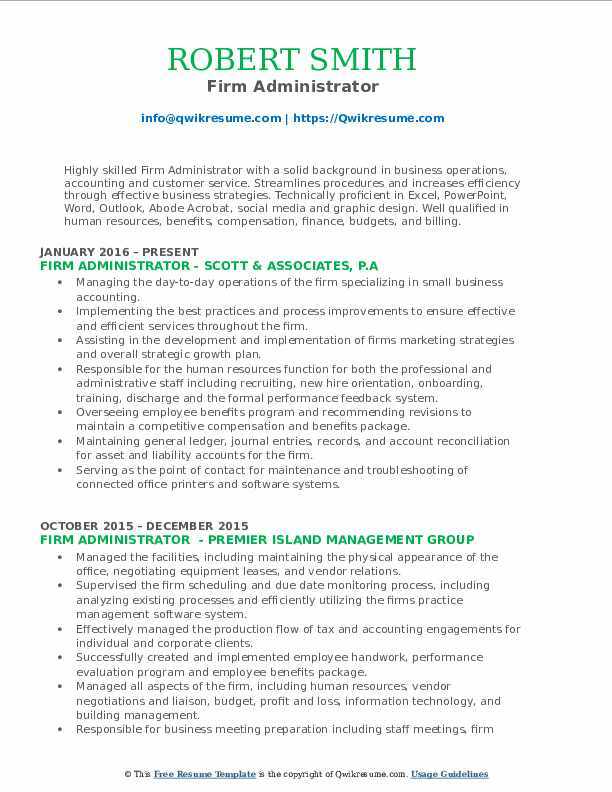 Well qualified in human resources, benefits, compensation, finance, budgets, and billing. Managing the day-to-day operations of the firm specializing in small business accounting. Implementing the best practices and process improvements to ensure effective and efficient services throughout the firm. Assisting in the development and implementation of firms marketing strategies and overall strategic growth plan. Responsible for the human resources function for both the professional and administrative staff including recruiting, new hire orientation, onboarding, training, discharge and the formal performance feedback system. Overseeing employee benefits program and recommending revisions to maintain a competitive compensation and benefits package. Maintaining general ledger, journal entries, records, and account reconciliation for asset and liability accounts for the firm. Serving as the point of contact for maintenance and troubleshooting of connected office printers and software systems. Processing semi-monthly payroll for all employees and federal tax deposits online. 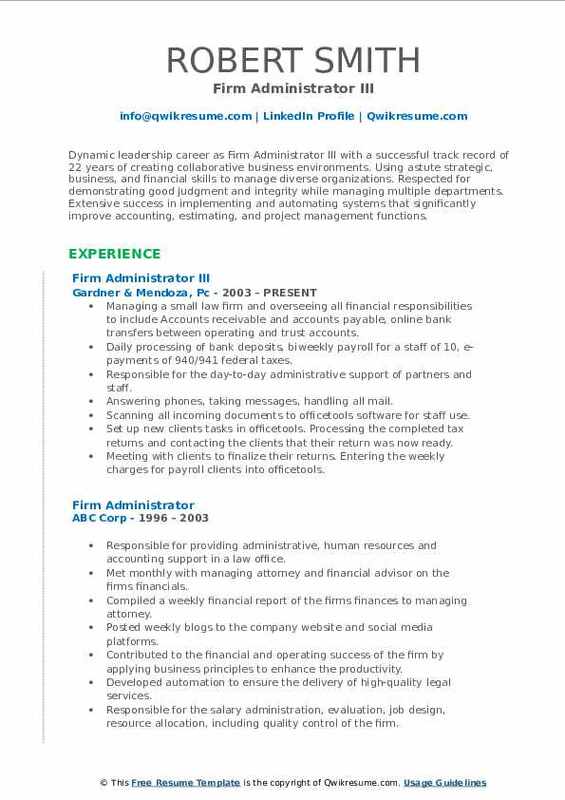 Objective : Firm Administrator having three years of management experience in financial and legal professional service organizations at regional and international firms specializing in real estate, securities, and foreclosure and is a natural problem solver. I have a consistent record of positioning organizations for success and building teams that demonstrate operational excellence. A dedicated hard-worker aiming to help achieve company goals and take on more responsibility as time progresses. Planning, organizing and being responsible for the day-to-day administrative operations. Directing the supervision of administrative staff, including hiring and coaching for top performance. Directing development, maintenance and implementation of standardized and efficient office. Collaborating with internal resources to ensure technology is reliable and current. Analyzing existing processes and efficiently utilizing the firm’s practice management software. Assisting president in analyzing, interpreting and evaluating administrative operations and. Working with internal HR to maintain the company's HR policies and ensure consistent application. Managing the facilities including maintaining the physical appearance of the office, planning for. Assisting in Continuing Professional Education (CPE) planning and on-going learning. Maintaining an adequate system of budgets and controls created to mitigate risk. 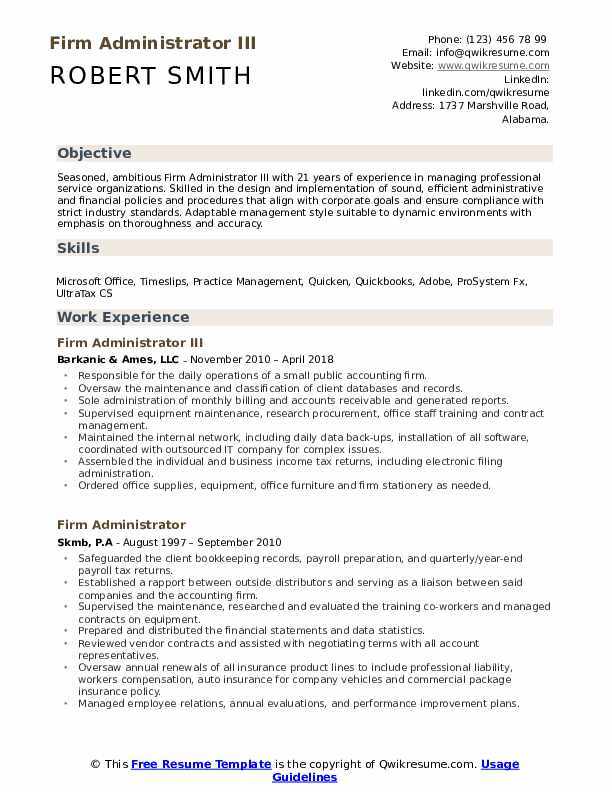 Summary : Loyal, organized and proactive Firm Administrator I adept at creating order and growing revenue by establishing office systems and procedures, implementing technology to improve operations and streamlining bookkeeping to deliver measurable results. Effective problem solver & team player with exceptional written and oral communication abilities. Cognizant of how the office management and ownership role affects the overall impression and success of an organization. Working directly with the CEO and president to manage all operational aspects of the firm. Head of administration department of five. Leading the weekly administrative team meetings to review timelines and budgets of firm projects and consult on any issues which arise. 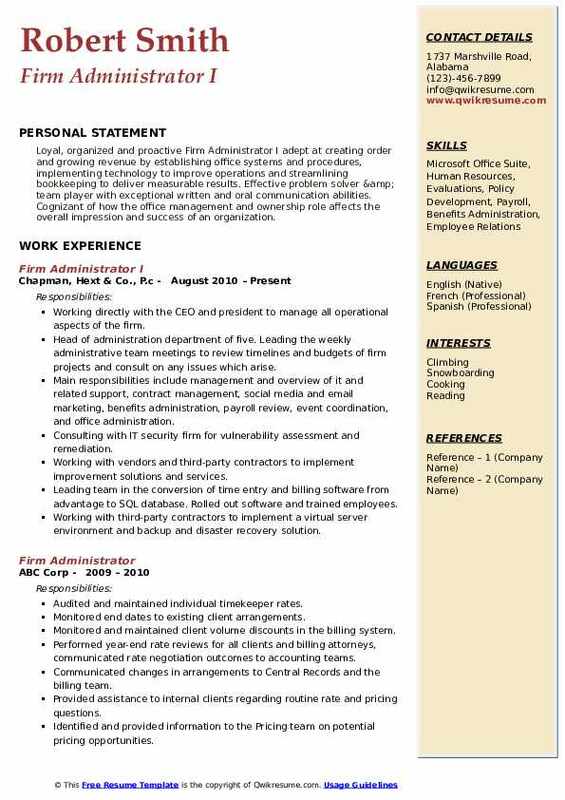 Main responsibilities include management and overview of it and related support, contract management, social media and email marketing, benefits administration, payroll review, event coordination, and office administration. Consulting with IT security firm for vulnerability assessment and remediation. Working with vendors and third-party contractors to implement improvement solutions and services. Leading team in the conversion of time entry and billing software from advantage to SQL database. Rolled out software and trained employees. Working with third-party contractors to implement a virtual server environment and backup and disaster recovery solution. Assisting in the implementation of web-based document storage and workflow software, giving us the ability to phase out 99% of client files after following document retention procedures. Objective : Talented Business Administrator with an exceptional background in the legal industry. Outstanding record of managing large and complex initiatives, negotiating large contracts, and reducing expenses. Created and implemented improvements in policies and processes to ensure streamlined operations throughout the firm. Skilled in managing major projects and programs, and led new initiatives from planning through tactical execution. Preparing tax returns for senior accounting members by incorporating prior and current year information along with identifying relevant and non-relevant information. Serving as the backbone of the corporation, often tasked with assisting other staff members on various administrative projects. Responsible for keeping the organization running smoothly, usually by anticipating upcoming projects and obstacles. Increased tax return turnovers rate by 15% by mastering a new tax software (autoflow) within CCH. Accessing which extracts relevant information and inputs the data into the CCH tax database, thereby. Improving the communication between the clients and the firm by learning and implementing a new technology (CCH portal) that allows for documents to be sent directly to one another through a secure network, resulting in a more efficient and effective means of communication. Gained a working understanding of 85% of the firm's technology and became the leading expert on the newly implemented software, resulting in an increase in the company's overall efficiency. Tasked with recruiting, training, and mentoring new interns on company procedures and provided one-on-one training sessions to get the interns to accustom to the firm.